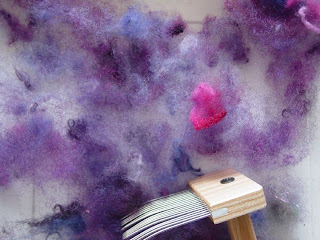 Froggy's Fiber Followings: My combs, my precious combs! My combs, my precious combs! On the plus side the batts came out real pretty. About a year ago I tried to sell these combs becuase I had only used it once and had no real love for the locks. I figured I would tease and card for the amount of trouble I was getting into. Now that I've used them again for the 3rd time there will be no such sale. Mind you, I couldn't since I bent the tines but also because last night I had a nifty little time with them. 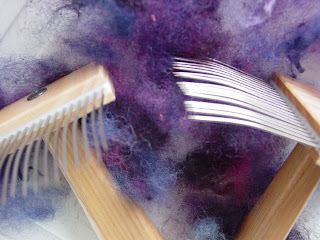 Plus, now I have all kinds of neat noil-y bits to felt with in the future. It's great to rediscover the usefulness of things, isn't it?